Located in Lushaer Town, Yuzhong County, 25 kilometers southwest of Xining, Kumbum Monastery (Ta Er Temple) is the activity center of Tibetan Buddhism in Northwest China. The temple features butter sculpture, frescoes and barbola. It also has a collection of Buddhism classical books and academic monographs in history, literature, philosophy, medicine, and legislation. Kumbum Monastery (Ta Er Temple) is situated on the hillside of the Lianhua Mountain. The buildings at the temple make a Han-Tibetan building complex, covering an area of 45 hectares. The temple offers more than 1,000 courtyards with more than 4,500 rooms, including Dajinwa Temple, Xiaojinwa Temple, Huasi Temple, Dajingtang Hall, Jiujian Hall, Da Lalang Hall, Ruyi Pagoda, Taiping Pagoda, Bodhi Pagoda, Guomen Pagoda, etc. Standing in the middle of the temple, Dajinwa Temple covers an area of 450 square meters. The roof is decorated with gold and silver, and the wall is built in glazed bricks. A 12.5-meter-tall silver pagoda stands at the hall. Inlaid with various jewels, wrapped in dozens of white "Hada", the base of the pagoda is made of fine silver and plated in gold. Originally built in 1631, Xiaojinwa Temple offers the specimens of buffalos, sheep, bears, a white horse and monkeys at the winding corridor. Dalalang Hall is composed of a scripture hall, Huamen Gate and Paifang Hall. The hall features the Han and Tibetan styles. As the largest building at the temple, Dajingtang Hall is a Tibetan flat-top building with civil structure. It is a place where the monks of the monastery congregate to chant the Buddhist texts. You will find a variety of caisson ceiling, large hanging barbola Buddhas, Tibetan patterns and other features of Tibetan Buddhism. There are more than 30 statues of Buddhas, and wood reliefs at the Huasi Temple. You can see Bodhi trees at the courtyard. The roof of Jiujian Hall is decorated with various types of birds, beats and flowers. The wall is built in glazed bricks. At the hall, the statues of Sakyamuni, Sixteen Arhats and the Four Buddha's warrior are worshiped. The best time to visit Kumbum Monastery (Ta Er Temple) is in the morning during the opening hours as it always takes several hours to explore the temple. The best months to visit are from June to August. There are only a few buses passing by the temple. Therefore, there are only a few options. Take Ta’er Temple Express at Xining City Management Station (西宁市内管理站, you can take Bus 23 to the station) to the temple. Take Tar’er Temple Express at the coach station. It is prohibited to wear shorts and short skirt to visit the temple. It is required to wear long clothes to visit the temple. It is prohibited to touch or move the Buddha images, offerings, or instruments in the temple. It is prohibited to take photos of the monks, Buddhism believers who are making a long kowtow and turning the prayer wheel. Please keep quiet in the temple. 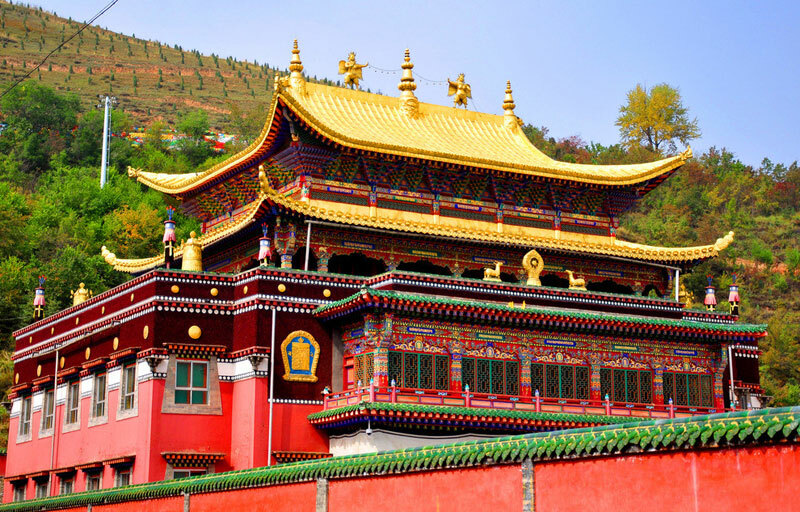 Interested in visiting Kumbum Monastery on a Tour? Wendy Wei Tours offers a variety of different packaged tours as well as custom tours including Kumbum Monastery, among other attractions and destinations. To find out more, please visit our Tours page or Contact Us directly to find out more.